It wasn't that long ago that the mere mention of the word FrontPage would bring forth guffaws from the coding cognoscenti. Such was the derision felt for its clunky, bloated output and standards-flouting coding that the program acquired a reputation as the numero uno tool of choice for blundering amateurs looking for a feast of bells and whistles on the cheap. Happily, this latest version sees enormous improvements, and a strong suspicion that Microsoft has been having a good rummage around in Dreamweaver's drawers. Just like their rival product, FrontPage now sports a split screen editing window, allowing authors to view (and edit) the raw HTML code as they tinker about in the Design View. 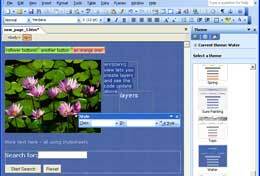 Pages can be created with new Layout Table feature, which positions text and graphics in a table-like framework. Page mockups can be manually 'traced' by positioning elements over a semi-transparent layer behind the editing screen. The code editor has been beefed up with a strong suite of HTML coding tools, including context-sensitive 'autocomplete' tags, Quick Tag Selector, Quick Tag Editor, advanced Search and Replace, code snippets and even a code optimiser. Once again taking their cue from Dreamweaver, FrontPage now offers a new behaviours task pane, offering a mass of ready to roll scripts for creating rollovers, drop down menus, browser detection etc, with control over embedded Flash movies. FrontPage still integrates with the rest of Office, sharing Office features like the Picture Manager and Clip Organiser. More importantly, the program now offers full support for XML, with the ability to create data-driven sites from flat-file XML documents, relational databases, OLE databases and Web services. Collaborative group working is supported by layout templates, where specified regions can be protected from unauthorised editing. 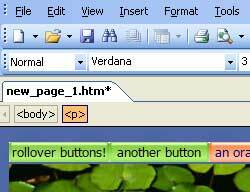 Many advanced features - like Web logs, issue tracking lists and data-driven news pages - require Microsoft's SharePoint services, but even without these useful extras, FrontPage remains a more than capable editor for those not requiring the hands-on power of Dreamweaver. And it's a lot cheaper too.